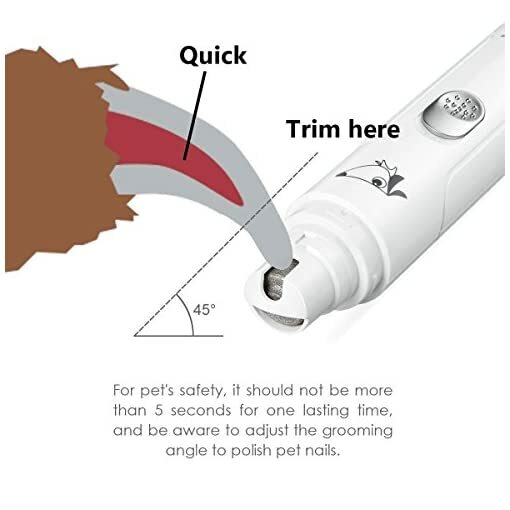 SAFE & EFFECTIVE – Constructed with diamond bit grinder, which is safer and more effective than nail clippers to trim the nails of your pets, reducing the risk of clipping the claws too short or hurt pets. The plastic cover can effectively prevent nails and cuttings from flying around. ULTRA QUIET – Super mute motor, brass shaft, unique mute technology, and acoustic noise in the process of operation within the 50 decibels. DURABLE & POWERFUL – The diamond bit grinder is more durable and much better than the old type with sand paper, no replacements needed. 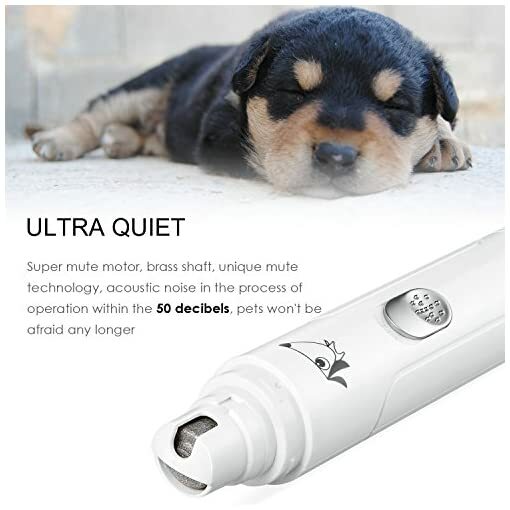 1.5 watts of power enables the grinder to be powerful enough to trim your pets’ nail in a short time. 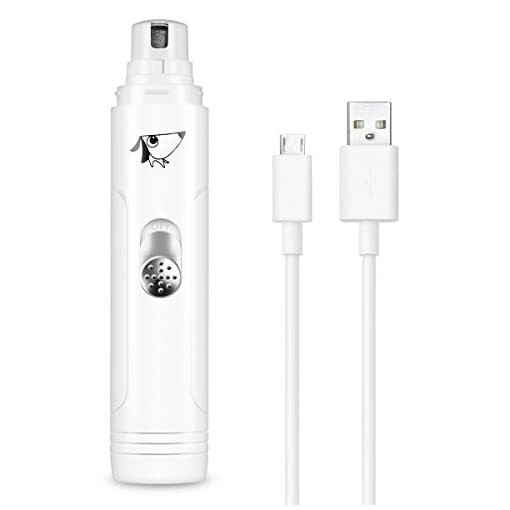 Amir® Rechargeable Gentle Paws Nail Grinder lets you trim your pets’ nails professionally and conveniently at home! 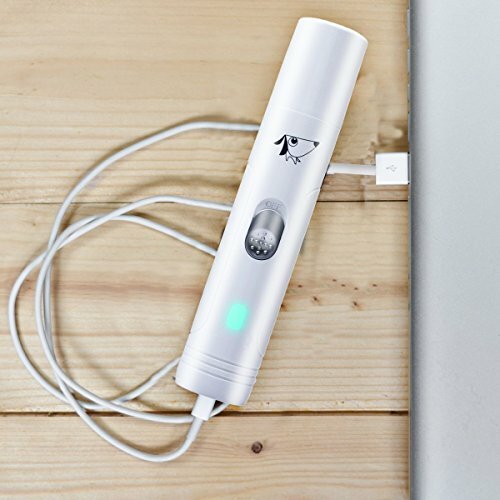 ● Step 1: Charge this nail grinder with USB for almost 3 hours. ● Step 2: Show the grinder to your pet, let it smell, listen to the voice, trim only one or two nails at a time, a lot of these can help reduce fear. ● Step 3: According to the pet’s size and characteristics of their nails, choose the suitable port for your pet. 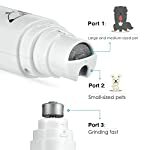 Port 1 is suitable for small-sized pets; Port 2 is for large and medium-sized; Port 3 (its side) is suitable for grinding fast. 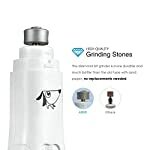 ● Step 4: Holding the grinder with one of your hands, holding the pet pads with the other hand, put its nail into a port gently, and then begin to grind. 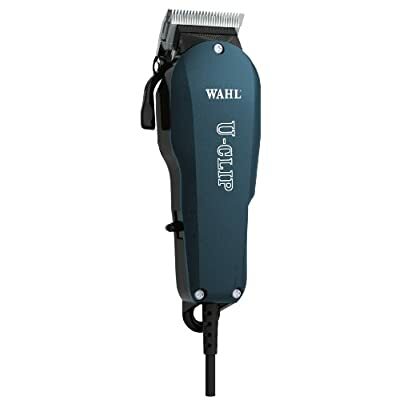 ● Step 5: Take off the plastic cover the grinder in an anticlockwise direction, turn it on and gently clean the surface of the nail grinder with eraser, paper or cloth to remove the nail powder. 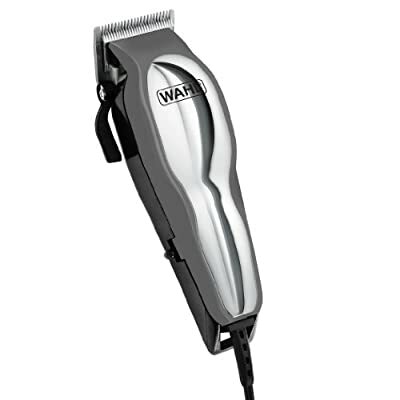 ▲ Please clean the grinder continuously to remove the nail powder of the surface for better usage. 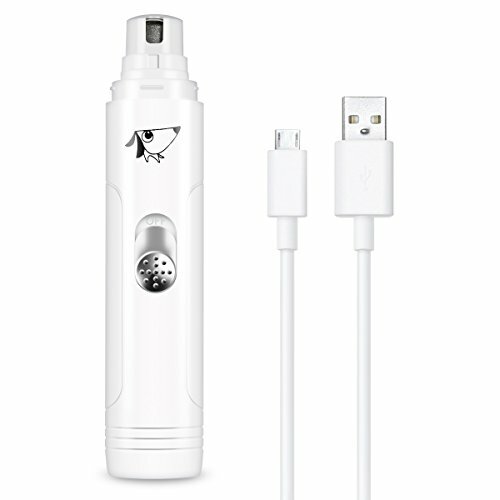 ▲ Please do not clean products with water or keep them in humid environment. 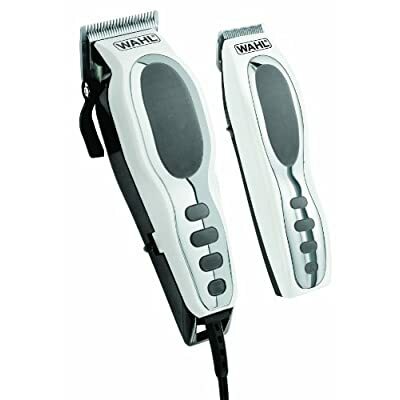 Clean it with moderately wet cloth or neutral soap. 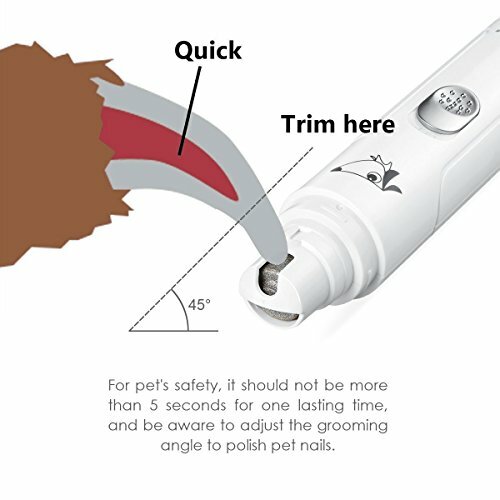 ▲ If it is the first time for the pet to use nail grinder, it’s endorsed that trimming the sharp or long nail first. 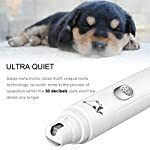 ▲ For your pet’s safety, one nail cannot be grinded for more than 5 seconds. 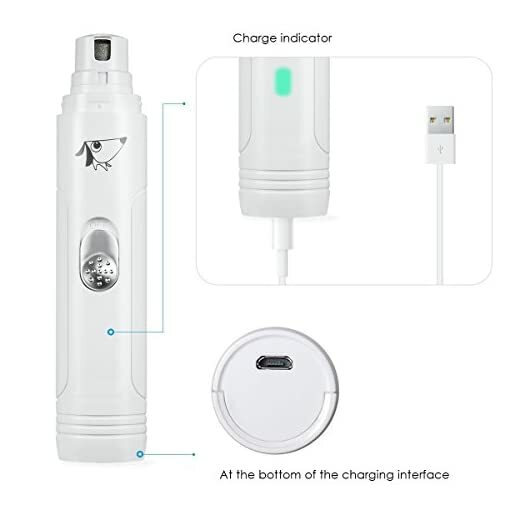 ▲ At the same time as charging the nail grinder, the blue indicator light will on but would possibly not change color after fully charging. 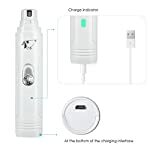 So remember of the time of charging. 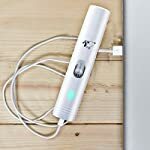 RECHARGEABLE – Designed to be rechargeable by USB with indicator light make it more convenient and free you from changing batteries that incessantly. 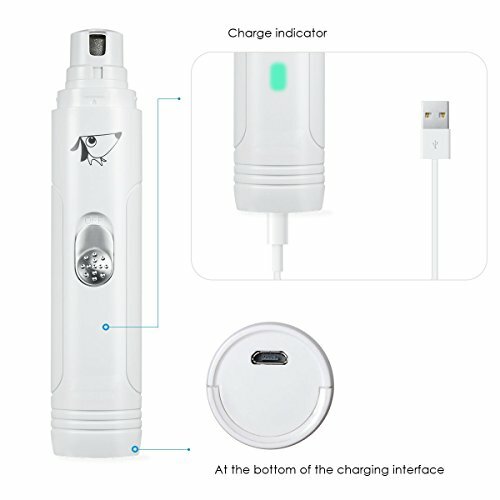 In general, it may be used for about 2 months after 3 hours of fully charging. APPLICABLE TO ALL PET – Works on all breeds of cats and dogs. 3 different ports for selection, choosing the suitable one for your pet based on the pet’s size and characteristics of their nails. 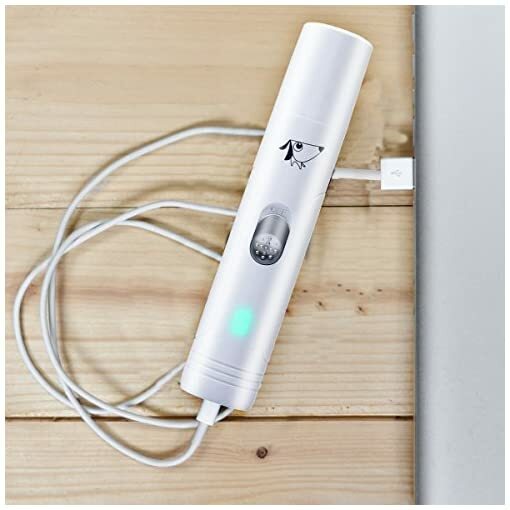 Human body engineering design, ABS resin, PS resin, comfortable to hold it.